The purpose of this paper is to review the evolution after 1959 of sugar production both in Cuba and among major world producers and to assess the role which sugar could play in the Cuban economy when the political circumstances allow for a return to a market economy and access to the U.S. market. Given the difficulties of obtaining first hand reliable information about Cuban costs and production conditions, the paper has relied fundamentally on published data as well as other documents prepared on the subject all of which have been properly quoted or referred in the text and the bibliography. The author would like to express his recognition to Ralph Kazi, former Statistician and Secretary of the Board of Czarnikow-Rionda, for his support in providing excellent sources and documents that were needed and were used in preparing this paper and for the cooperation of his former student and colleague, Economist María Inés Fernández, whose devotion in flushing out our vision on the subject deserve the consideration of co-author of this document. Since colonial times, sugarcane production has played a leading role in the Cuban economy. While a colony, sugarcane and tobacco were preferred over other crops for different reasons. Fruits and vegetables as well as fish and meat were not suitable to the long trip back to Europe and local tubers, such as yucca (yucca), did not have a market. Spain had forbidden the planting of cotton, wheat and rice. On the other hand the flatness of the land and the possibility of farming most of the year made sugar cane one of the most beneficial crops, on an island where 52% of the land was arable. Sugarcane has also some advantages over tobacco. While sugarcane is homogeneous crop whose quality is not greatly affected by the micro-climate, this is not the case of tobacco culture where a special knowledge and expertise is also required. Increasing tobacco production requires very intensive manual care, fertilizers, herbicides and fungicides, inputs that tend to increase production costs. In the case of sugarcane, no such intensive cultivation is needed. At the beginning of this century, the United States was the largest consumer of Cuban sugar. The topography of the island and its proximity to the U.S. market resulted in low transportation cost both by rail and roads and short shipping time to U.S. ports. Inasmuch as local consumption was relatively small, because the population of the island was not large, almost all the production was exportable. In turn the United States exported to Cuba all the products that it needed. For this reason, the prosperity or recession of the economy in Cuba depended on the fluctuation of the prices of sugar in U.S. and international markets, which was a factor outside of the control of the country. For most of this century, Cuba has been either the largest or among the largest sugar producers in the world. In the 1920’s, it was the world leading producer. In the years just preceding the 1959 Revolution, Cuba’s exports of around 5 million tons annually provided almost one-third of global sugar exports. This important participation in the world market, as well as its capacity to increase supply by 2 to 3 million MT in a given year, made Cuba also the dominant factor in policing the International Sugar Agreement and gave the island a major role in the International Sugar Council in London whose purpose was to maintain an orderly market. After the Second World War and until 1958, Cuba consolidated its commanding role in the international sugar market. During those years, Cuba was not only among the three largest producers, but was by far the largest exporter. Cuba also enjoyed a privileged situation due to its share of the S. sugar market. The U.S. quota system allowed Cuba to export over 50% of its production to the United States at the highly protected prices of the U.S. market. The implicit subsidy to the Cuban economy that resulted from the U.S. quota allowed Cuba to have available a substantial stand-by reserve of almost a million tons of raw sugar and a capacity to extend the crop season and harvest for almost an additional million tons, when needed. This reserve — amounting to almost 20% of what at the time was the volume of the international sugar market — allowed Cuba to be a market leader that was very efficient and effective in controlling price and thus the cornerstone of the International Sugar Agreement. 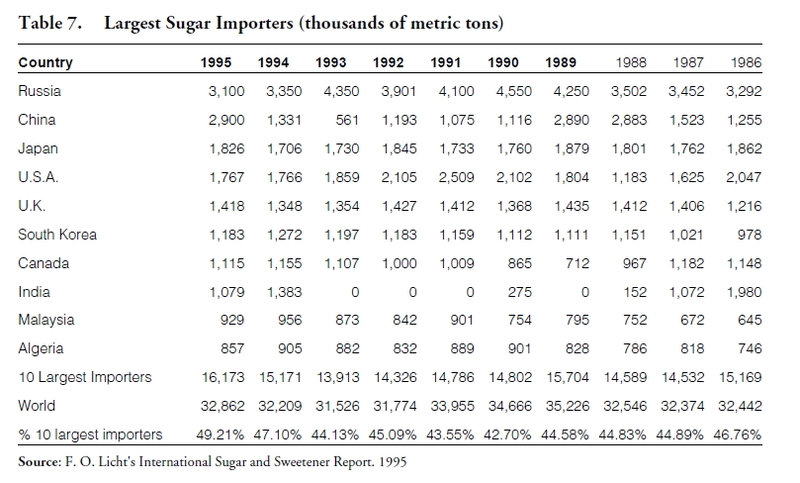 At the time of the 1959 Revolution, the United States bought annually nearly 3 million tons, or 60% of Cuba’s annual sugar exports (Buzzanell and Alonso, 1989). This commercial relationship collapsed in 1960 when Cuba nationalized U.S. oil refineries and other businesses. The United States suspended Cuba’s sugar quota and embargoed all trade. Cuba was able to maintain a fairly high, but not efficient, level of sugar production due to the subsidy paid by the Soviet Union. Cuban sugar was sold to the Soviet Bloc (Soviet Union and other socialist countries in Eastern Europe) and China at prices that were far above the world market. The 1960’s were characterized by uneven performance in production because of the exodus of many experienced managers and skilled field and factory workers, and the transformation of production to a Socialist model. 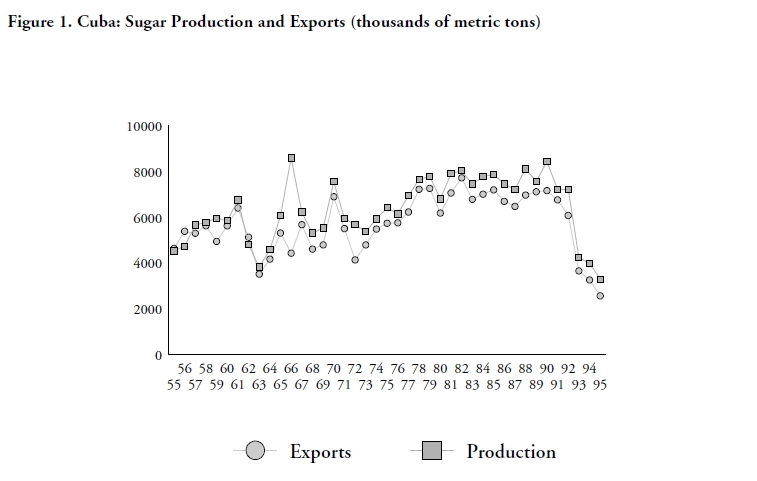 By 1965, two-thirds of Cuba’s sugar exports were shipped to Socialist markets. Trade ties were solidified with these countries through a series of agreements, including access to the Socialist world’s Council for Mutual Economic Assistance (COMECON) (Buzzanell and Alonso, 1989). Cuba sold one-third of its export to the free market to receive hard currency from nonsocialist countries, such as Canada and Japan. During the 1970’s, Cuba’s regime expanded sugar production, beginning the decade with the “long harvest” of 217 days in 1969/1970, during which the nation’s physical and human resources were focused on producing a 10 million ton sugar crop. But this effort produced a sharp fall in production the next three years. 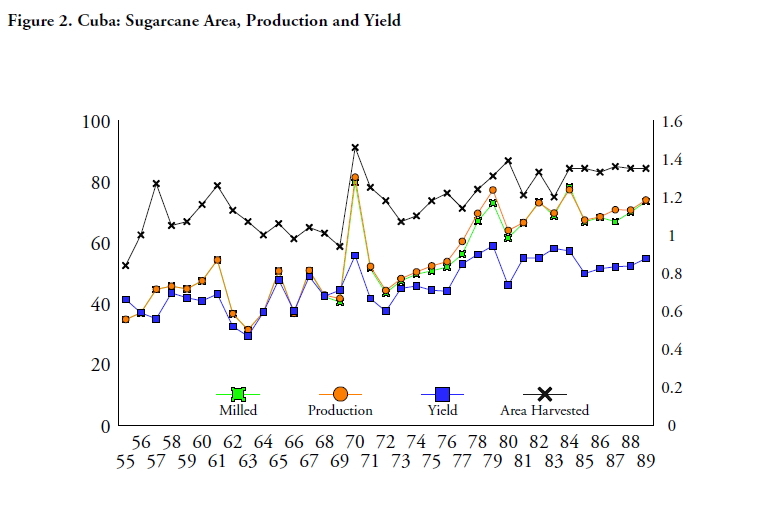 Production bounced back toward the end of the 1970’s due to the expansion in area harvested and improved sugar yields. In the late 1980’s, between 50% and 60% of Cuban exports went to the Soviet Union, by then the world’s leading importer. During most of the 1980’s, Cuba has been hard pressed to meet its commitments to COMECON countries and to produce enough sugar to sell for hard currency. In 1987 and 1988, the situation got worse, as poor crops and exports over commitments led Cuba to mortgage its sugar export future: Cuba promised part of its 1989 crop as collateral to repay over 1 million tons of sugar borrowed from a major international trade house Sucre et Denre (Sucden) to fulfill export commitments to the Soviet Union. Between 1970 and 1990, Cuba’s sugarcane agriculture switched from manual labor to machinery: 67% of the area was harvested by machine combines in 1988/1989, compared with 45% in 1980 and 25% in 1975 (Buzzanell and Alonso 1989). After the fall of the communism of the Soviet Union, Cuba’s production collapsed as well and now Cuba is not even among the ten largest producers of sugar and ranks only as the fourth exporter, with half the export volume of Australia. New efficient sugar exporting countries have appeared (Thailand, Brazil, Guatemala, Australia and Colombia) so that if Cuba were to apply appropriate cost and price methods, it might be that it is lagging far behind those countries in terms of profitability. 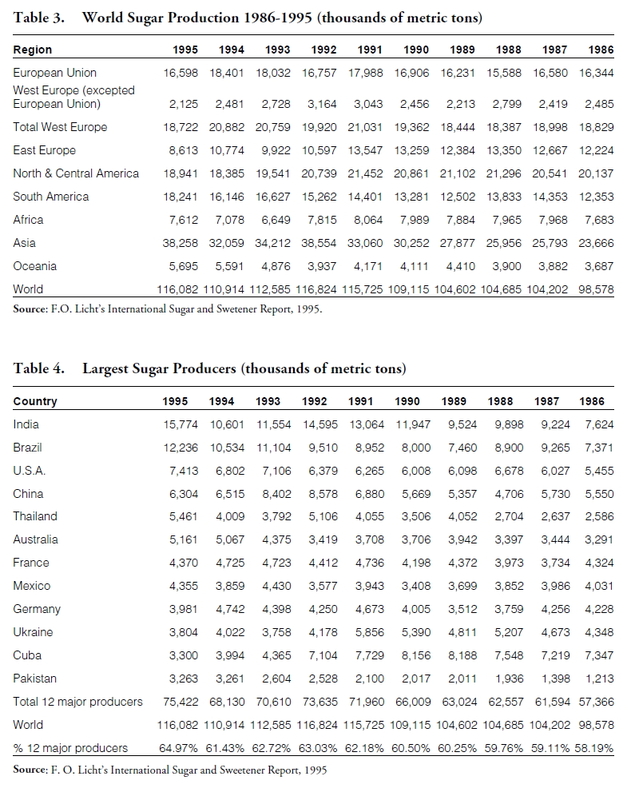 Changes in Cuban sugar production and exports are presented in Table 1 and Figure 1. Sugar production between 1950 and 1955 averaged 6.3 million tons per annum and exports averaged 5.7 million tons per annum, with a maximum of 8.4 and 7.2 million tons respectively in the year 1990. The figure shows the strong correlation between production and exports as well as the fact that consumption is a low percentage of production. Large production increases were recorded in 1961 and 1970. 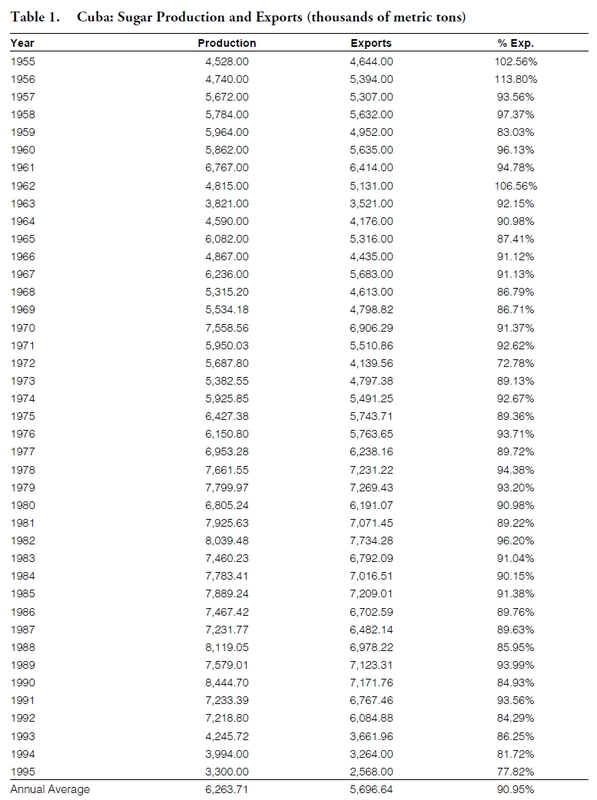 After 1973, there was a steady increase in production through 1990. After 1990, production collapsed to almost 4 million tons, a level similar to that recorded in the worst production years of the period, 1963 and 1973. Figure 2, based on Table 2, plots critical production factors such as area, sugarcane yield, sugarcane milled, and production. 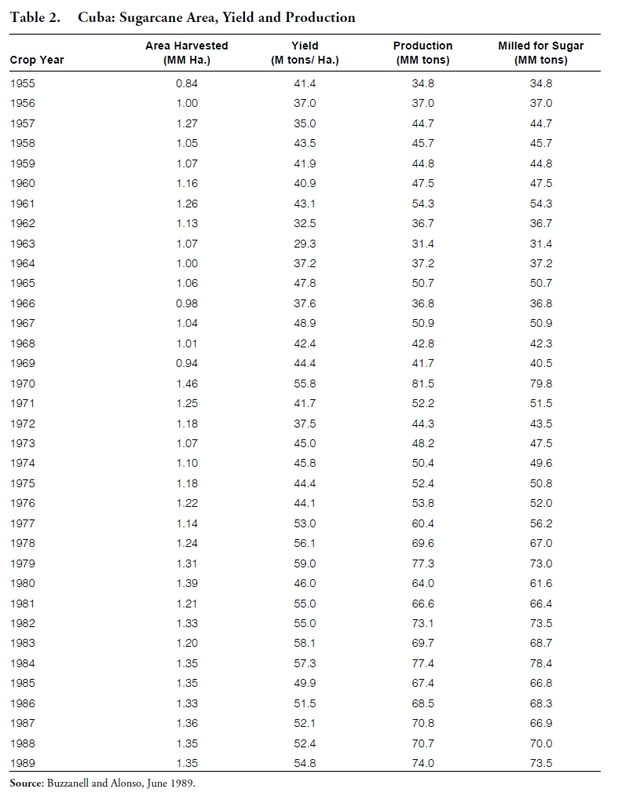 It is interesting to notice that after 1968, the amount of sugarcane milled in many years was lower than the amount of sugarcane produced, which could indicate increasing problems with industrial plants as well as the harvesting process. Major world sugar producers by region are presented in Table 3 and Figure 3. The top twelve producing countries accounted for 65% of world production in 1995 (Table 4). Meanwhile, the 10 major consumers totaled 56% of world consumption (Table 5). In comparing production data for 1986 and 1959 we see countries with a very high rate of increase (such as Thailand, China, France and Pakistan, where production has increased by over 300%), while in Cuba production grew by only 23%. In fact, after 1959, Cuba had the lowest increase among major producers and was the only country among them with an increase lower than the world average. In the decade between 1986 and 1995, production increased at significant rates in countries such as India, Thailand, and Pakistan, while Communist countries such as Cuba and Ukraine had poor performances during that period. While world production increased in the last decade by 18%, consumption increased by 14%, as consumption fell sharply in Russia and grew at a slow rate in Germany, Japan and the United Kingdom. mainly due to increases in imports by China partially offset by decreases in India and the United States. Imports by Japan and Canada— Cuba’s main non-Communist markets— were reduced by 2-3%. Sources do not explain this contradiction between increases in world imports and decreases in world exports. CAN THE CUBAN SUGAR INDUSTRY REVIVE? The loss of the privileged markets of the former Soviet Union and the countries of COMECON, which paid very high prices for Cuban sugar— up to four times the world market price— as the United States had done in the past. Because of this, the Cuban government has been hoping to receive foreign capital in order to help reactivate the economy. The Cuban government is willing to accept loans that have seniority in collection, secured by sugar produced until repayment is completed. The Cuban sugar industry not only needs new capital influx but also management and technical expertise to meet competitive challenges in the markets of potential customers. The interest of the international community in investing in Cuba is demonstrated by an offer of financing from the Netherlands International Group (ING), which provided a credit of $30 million, to be paid back with sugar, a method usually called a red-clause loan. According to ING, Cuban production could go back in five years to the 8.5 million ton per annum level. This is considered too optimistic not only because, from the production side, it would require the industry to produce 35% over the average of the last years in a very short period, but also because it would be difficult to place the increased production of sugar in the world market without bringing about a substantial reduction in price levels. Many of Cuba’s former communist markets— such as East Germany, Hungary, Poland, and the former Soviet Union, with exception of Russia— do not need to acquire raw sugar in the international market, as they now have sufficient production themselves. Additionally, Cuba’s traditional non-Communist markets since 1959— Japan and Canada— have ceased to grow (“Cuba Struggles” 1995). If Cuba is not able to rely on preferential treatment by its trading partners, in order increase production and sell its output it will have to compete efficiently for market share. While there are no available or accurate data on Cuba’s cost of production to enable one to compare them with those of the major present exporters, we can extrapolate the results by looking at the past as a proxy. It is obvious that there are now new major exporters that were able to achieve that position in a free market and therefore have demonstrated their ability to compete on prices, reliability, timely delivery, etc. There is no assurance that Cuba could reach such level of efficiency simply on the basis of its climate and soil condition. Therefore, it is an open issue whether Cuba can regain a predominant position in the sugar export market without the advantages it had in selling 60% of its production at a preferential price to the United States and later doing the same at even higher prices during the communist era when preferential trade agreements prevailed. It is not evident that Cuba could recover its leading role in the sugar international market under the present circumstances, even if a dramatic change were to take place in the economic and/or political conditions of the island. To better its position in the sugar market, Cuba will require to steadily improve its agriculture and industrial efficiency by going back to rational, market-oriented production and will need a considerable infusion of capital invested both in the sugar mills as well as in the cane fields and transportation infrastructure. The United States will not abandon its current suppliers of sugar just to accommodate Cuba. Thus, although the change in the political system would certainly facilitate improvements in the sugar industry, it will not mean a miracle turn-around whereby Cuba will again enjoy a privileged position in the U.S. sugar market as a factor to regain a commanding role in the World Market. At present, we ignore Cuban cost of production, but having lost its privileged markets that provided it with a substantial subsidy, and having to compete with new countries (such as Brazil, Colombia and Australia) that have established their predominance in a free market environment, without any benefits or privileged associations, it will very difficult for Cuba to regain in the short run its leading position in the international sugar market. Buzzanell, Peter, and José Alonso. “Cuba’s Sugar Economy: Recent Performance and Challenges for the 1990s. “In USDA Sugar and Sweetener Yearbook (Washington: U.S. Government Printing Office, June 1989). Carreño, Pablo A. The Cost of Reconstructing the Sugar Industry in Cuba. 1994. “Can Foreign Capital and Restored Markets Markets in Russia and China Revive the Cuban Sugar Industry.” F.O. Licht’s International Sugar and Sweetener Report (April 13, 1995). “Cuba Struggles to Revive Sugar Sector.” F.O. 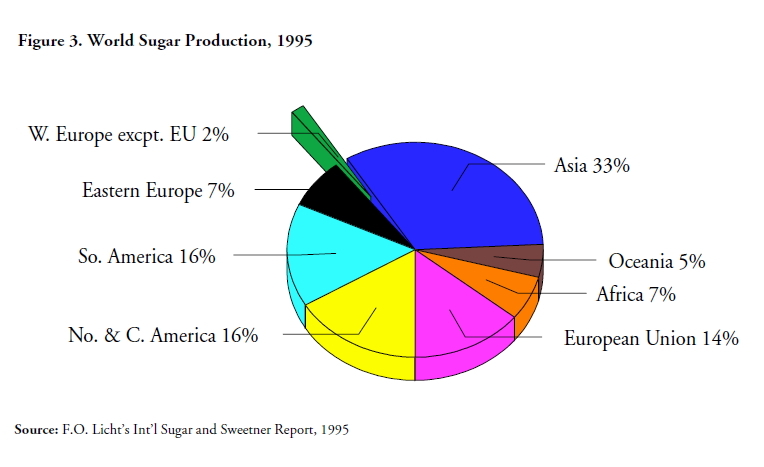 Licht’s International Sugar and Sweetener Report (March 17, 1995). Grupo Cubano de Investigaciones Económicas. Un Estudio Sobre Cuba. Coral Gables: University of Miami, 1963. “Third Estimate of the World Sugar Balance, 1994/ 95.” F.O. Licht’s International Sugar and Sweetener Report (June 21, 1995). “World Sugar Balance,” F.O. 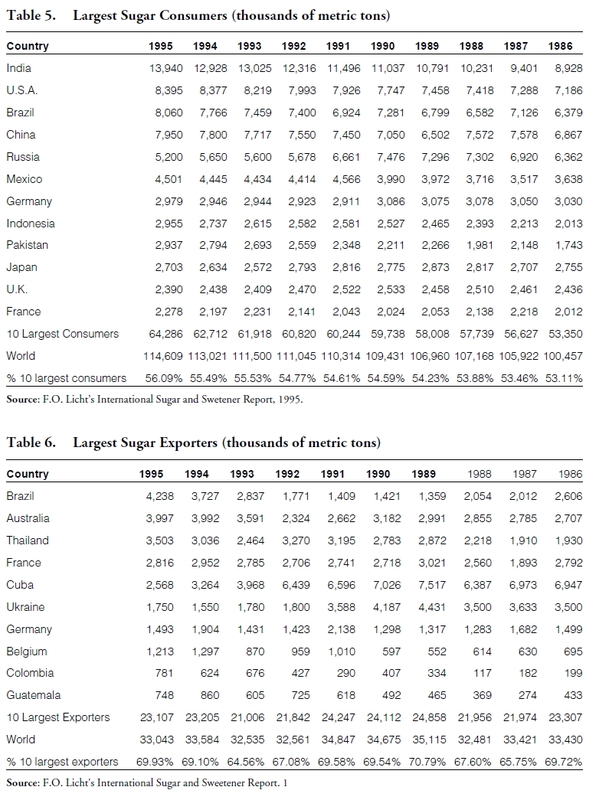 Licht’s International Sugar and Sweetener Report (1995). Oscar A. Echevarría is a businessman, economic consultant and academic. He is the founder and current President of Global Expand LLC., a Washington, D.C.-based company devoted to helping small and medium size firms in Spain, Latin America and the United States to establish cross-border and national strategic alliances. From 1992 to 1995 he was Chairman and CEO of Czarnikov-Rionda Company of New York, a company that he turned into the largest Hispanic-owned business in the U.S. He has been a Professor of Economics at the Graduate School of Georgetown University, the Universidad Católica Andrés Bello in Caracas and a guest lecturer at Stanford University, Wharton Management Science Institute and Harvard Kennedy School of Government. He has published extensively on foreign debt and foreign exchange policies and on the economies of Cuba and Venezuela. Dr. Echevarría holds a Ph.D. in Economics from Georgetown University.